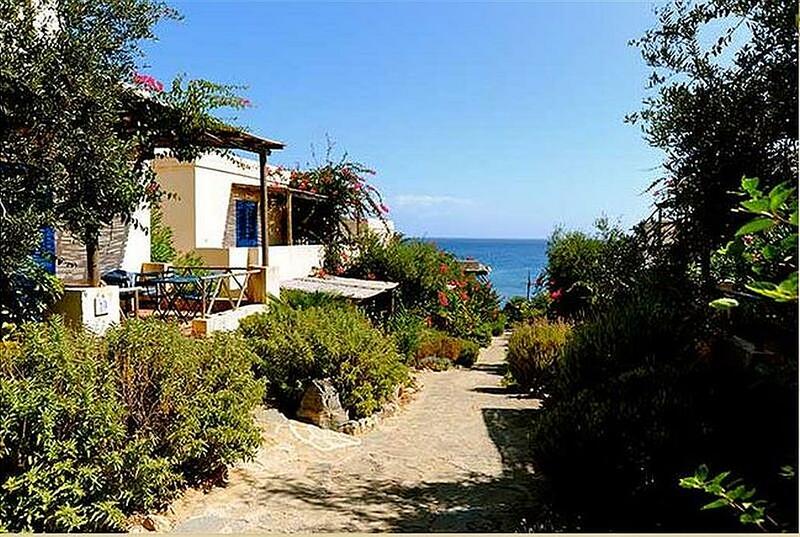 The residence boasts an ideal location, the perfect base for a wonderful relaxing holiday on a beautiful island, with a diverse range of activities at guests' disposal, a friendly atmosphere, delicious food and a slow and gentle pace of life. The Residence is the only tourist complex in the island, built by respecting the environment. The entire structure was made up with concern for the environment preservation: a sewage waste water treatment plant for irrigation purposes; debacterisation through UV rays for drinking water; furniture with natural materials ; solar panels for water heating; use of ecological and organic detergents. The estate is located by the sea, surrounded by the greenery of the island and under a blue sky. It consists of apartments with an equipped veranda or terrace, a Mediterranean garden, playground, swimming pool with whirlpool (open from June to September ) and relaxation areas. "Dinner with the fishermen" where the staff of the fishing vessel Matteo Padre prepares fish dishes with the catch of the day. Every day, in the "Coffee" area, a breakfast buffet with local , organic or dietary products, and a brunch with salads and cold dishes are prepared. The Three-room apartment (50 sqm) is located on the ground floor and consists of a double bedroom, a bedroom with 2 single beds, living room with fully equipped kitchenette and sofa bed, a bathroom with hairdryer, bathroom antechamber, a veranda with table, chairs and deckchairs. The kitchen is equipped with electric stove, a complete set of cookware and kitchenware, fridge and freezer. In addition to this, the Mediterranean garden of the residence is equipped with patio, barbecue on common use, children's playground, swimming pool with whirlpool and outdoor workout course. Three rooms can also accommodate disabled persons: adapted toilets, shower fit, wide door of 90 cm, ground flour. The Resort is located in the island of Marettimo, the most remote and mountainous island of the Egadi archipelago. Marettimo was the first island to break away from Sicily. The beauty of its wild and untouched nature, the Dolomites-like panorama meet with the Caribbean-like sea view make the island perfect for every type of tourist: fans of the sea and underwater exploration, cave exploring lovers and all those who wish to get rid of the city bustle. Guests can spend their time in different ways, depending on their preferences: a boat ride around the island to admire the stunning sea caves and the coast, scuba diving in the crystal and clear depths, hiking in the mountains, trekking. Thanks to the hydrofoil you can also make trips to the neighboring islands. In the nearby area there are excellent shops for all the needs, catering, local bars and cafes. The price includes bed linen and towels, use of swimming pool, baggage transport (on request), wi-fi (available in the cafe bistro, in the panoramic room), consumption of water and electricity, parking. Final cleaning: monolocale 45 €, bilocale 55 €, trilocale 65 € . Daily cleaning: monolocale 15 € , bilocale 20 €, trilocale 25 €. Canoe rental: 10 € /1 person, 15 €/2 persons about 3 hours. Check-in time: from 5 p.pm.